Lvov (or Lviv), a city in western Ukraine, is where the members of my family who never made it to America were last seen before they were killed during the Holocaust. I have never known much about them, but a few years ago my sister did some research to try and figure out what may have happened to them. The results of her research were inconclusive. Since then, I’ve wanted to know what happened and have often wondered what Judaism is like in Ukraine; so when I saw the announcement of the trip to Kiev, Ukraine, for Active Jewish Teens’ (AJT) International Conference, I couldn’t help but get excited. So I asked my parents. On our first day, we spent time at the Halom JCC learning from the employees of the beautiful building and volunteering with young children in an art class. Afterward, we went grocery shopping for economically challenged and impoverished families, some of whom are Holocaust survivors or descendants thereof. Through the Chesed program, we visited their homes, too. The opportunity to connect with these people was incredible as we could see how they remained so close to their Judaism. We saw right from the beginning that Kiev has a vibrant and thriving Jewish community that was only going to grow in the coming years. This part of the trip was very emotional, as most of us had never experienced this level of graphic and horrific detail about the Holocaust until we were at the site. We held a memorial service to remember the lives lost. 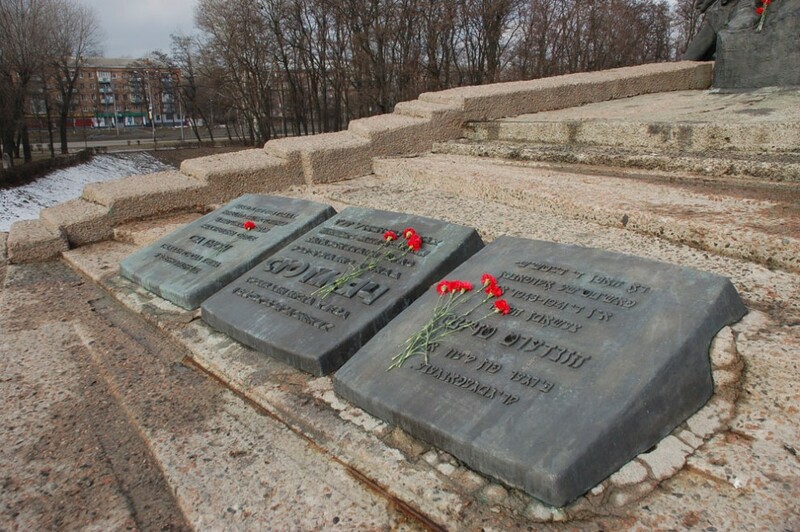 We read poetry and stories written by Babi Yar survivors, including one survivor who had lain motionless among the corpses in the ravine for days, waiting for a safe time to climb out without being caught. I looked around and saw that, although we knew the past of that place, nature had moved on and continued to grow — strong and beautiful. Rabbi Meir pointed out that, no matter how hard it may be to see, there is always a way out … a hope for a better future. It was incredible to see that — after such a tragic past — there is such an unbelievable renaissance of Jewish life in Kiev today. We knew that once we arrived at the AJT conference, we’d get to be a part of that renaissance, even if only for a couple of days. Throughout our immersion in Kiev, we had witnessed countless examples of the revival of Jewish life and efforts to bring a brighter Jewish future in the FSU. Once we arrived at the AJT conference, though, we saw that brighter tomorrow in the faces of hundreds of Jewish teens. We saw the teens hugging and holding each other tightly because they knew that they only had one shot a year to spend time together. That one shot, that one opportunity, was at that conference, those four simple days. We saw teens introducing themselves all weekend long, no matter how late; one girl even introduced herself to me as I left the hotel for the airport to fly home. Most importantly, we saw proud FSU Jewish teens. We heard them singing as loud as they possibly could, even when their voices weren’t pitch-perfect, during every session they could. We joined them in Israeli dances at every spare moment. We saw that they were all absolutely enthralled by session after session after session of Jewish history and biblical stories. It was like nothing I’d ever experienced before in my life. What fully removed the language barriers, however, was when we joined together and spoke the same one. After Havdalah — a staple of every BBYO and AJT event — we witnessed every teen running to all of his or her friends to say, “Shavua Tov!” and to give tight hugs. In my experience, this feature of many BBYO Havdalah ceremonies is frequently euphoric and sometimes even a little superficial, but not at all so with AJT. In fact, this was the most genuine, authentic and down-to-earth moment of the conference. As I ran from person to person, I looked around and saw that it was not just my friends I hugged, but total strangers. I noticed the amount of love and genuine sentiment packed into each and every time someone told another person, “Shavua Tov!” I could see vividly in everyone’s eyes and feel powerfully in everyone’s arms that each greeting meant so much more. This story was previously printed in “The Shofar,” a BBYO publication. Fana Schoen is a junior at Emmaus High School. She is the Allentown BBG Chapter Sh’licha and also serves as the acting Mazkirah and acting Gizborit for Allentown.